The Sunday, November 9th Guardian had a series of short articles on collecting, including one on why people collect things. This was similar to the New York Times’“Room for Debate” series on Why We Collect Stuff. I liked the Guardian’s “Love, anxiety or desire?” question, and asked it of myself: why do I collect? Collecting is something that I had given up for a while, given that so much of what Mr S and I had collected was stashed in boxes in our basement after an apartment move nine years ago. Nine years! If you haven’t unpacked in that time, do you really even care about those things? No, not really. Many the things I unpacked recently as we went through the basement again are destined for Etsy: McCoy pottery vases, colorful Pyrex, FireKing glassware. I bought it at a time when I liked green pottery—it was an outgrowth of the blue and yellow creamware I’d begun collecting when I first lived in Rhode Island. But now, I’m done with it: done with the mid-century modern, and going back to the early American things. There’s an aesthetic quality I like in both styles: simple lines, bright colors. 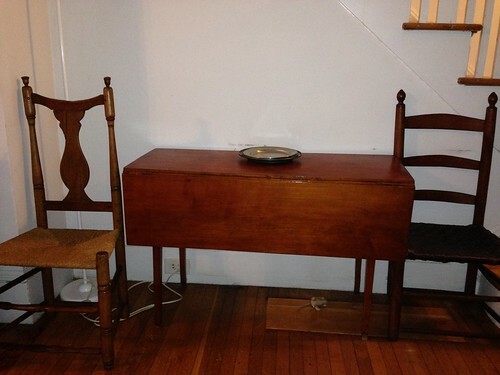 The most recent acquisition is a drop-leaf table in a very country Sheraton style, with a tiger maple skirt. I watched this table for months before finally committing to it, and dragging Mr S up there late Saturday afternoon. He was game, and in the past day the table has grown on him. Why did I want it? For one thing, it reminds me of a maple drop-leaf Sheraton-style table my mother has, so perhaps there’s an element of nostalgia, or a desire for approval. I also imagined it exactly where it is, though it will require some adjustment in lighting. Did I buy a piece not only of the American past, but of my own? Is this what adulthood looks like? Or am I just responding to shape and color? The table and chairs are low, and not comfortable in the way that modern furniture is: I wouldn’t want to sit in the chairs or work at the table every day, but these things give me pleasure, whether bought for love, anxiety, or desire. I have two groups of collection. One is the current research topic which often comes down to ‘must have more, must know more’. Simple, raw. Then there is the collection which is all about love, longing, and connection. This is the family pieces; that which reminds me of family and dear ones. Much of this is still in storage due to the spacial issues two very different concepts of ‘home’ and ‘stuff’ coming together with my husband and I. I truly long for my dear pieces. I lay awake at night, mentally rearranging the house trying to make space. I ponder endlessly what might convince my husband that my particular something is far more practical and pleasant to the eye than his particular something. I even go through phases where I want to give up sewing, casting all the sewing stuff from the house just so I can have that one wall free for my desk and a chest. I want to sit with my things, to look at them, to run my hands over them. Alas, soon. Hmm. I know people with both types of collections. I’m lucky enough to work in a place that can satisfy “must know more!” for me, so I can spend more time on other things. about what I’ll keep, but using much more of what we have, just to have it upstairs with us.